May 21: Police were dispatched to ACME, 1619 Center Square Rd, for a report of shoplifting. Upon arrival it was learned that an unidentified black male had departed the store without paying for the product in his cart. Stolen from the store were Tide detergent Pods and a Keurig coffee maker. The estimated value of the loss is $350. ACME staff was able to provide a registration for the vehicle the male entered upon leaving the store however the registered owner of that vehicle has not been located. The investigation is ongoing. May 24: Philadelphia Police recovered a Dodge Ram pickup that had been reported stolen from Heidi Ln in October. May 25: Police conducted a motor vehicle stop on Route 130 for a cell phone violation. Upon making contact with the driver, an 18 year old Penns Grove man, the odor of marijuana was detected coming from the vehicle. A K-9 also indicated as to the presence of narcotics within the vehicle. A subsequent probable cause search revealed a quantity of marijuana packaged in a sandwich bag. 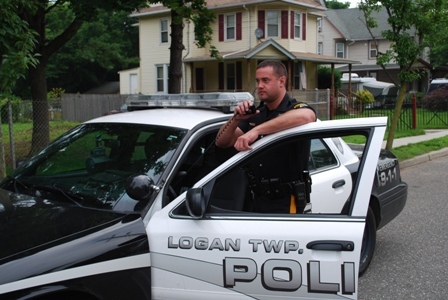 The driver was arrested and transported to headquarters where he was charged with Possession of Marijuana Under 50g, processed and released pending a date in Logan Township Municipal Court. May 29: Police were dispatched to Route 322 in the area of I-295 for a report of theft. Upon arrival it was learned that during the overnight hours, someone stole a directional drill head valued at $5000 from a piece of construction equipment in the area. No suspects could be identified. May 30: Police conducted a motor vehicle stop for a suspended registration. Upon making contact with the driver, a 31 year old Collingswood man, the odor of marijuana was detected coming from the passenger compartment. A subsequent probable cause search revealed two plastic vials containing suspected marijuana. The driver was arrested and transported to headquarters where he was charged with Possession of Marijuana Under 50g, processed and released pending a date in Logan Township Municipal Court. Jun 2: Officers were dispatched to the parking lot of Uptown Bakeries, 2271 High Hill Rd, for a motor vehicle crash. Upon arrival it was learned that the driver of a vehicle entering the lot lost control, struck a curb, then careened across the driveway, striking another curb, a parked vehicle and an electrical junction box. A 35 year old woman from Camden was seated on the electrical box at the time of the collision and was struck by the out of control vehicle, suffering injuries to her legs and abdomen. A 28 year old Camden woman who was seated in the parked vehicle suffered injuries to her arm and abdomen. Both women were transported to Chester Crozer Medical Center for treatment. The driver of the vehicle which caused the crash had fled the scene on foot prior to police arrival. The ensuing investigation identified the driver as 41 year old Adrian Rodriguez of Penns Grove. He has been charged with Assault by Auto, Criminal Mischief and Obstruction of Justice as well as numerous motor vehicle violations. His whereabouts are unknown at this time and a warrant has been issued for his arrest. Jun 3: Police stopped a motor vehicle for an equipment violation. Upon approaching the vehicle the officer immediately detected the odor of marijuana coming from the passenger compartment. After advising the occupants of the vehicle of his observation, the driver, a 26 year old female from Bear, DE, surrendered a partially smoked marijuana cigarette and a quantity of suspected marijuana. She was arrested and transported to headquarters where she was processed and served a summons for Possession of Under 50g of Marijuana. She was released pending a date in Logan Township Municipal Court. Jun 4: Police were alerted that a vehicle which had been reported stolen on 5/16/18 had been located in Oldmans Township. Detectives responded and impounded the truck to be processed for evidence as to the suspect(s) identity. Jun 4: An employee of UPS, 200 Birch Creek Rd, reported that her wallet was stolen from her bag while she was working. A review of the video surveillance of the incident failed to identify the male suspect. June 9: Police conducted a motor vehicle stop for an unclear license plate violation. Upon making contact with the driver, he advised that he did not have his identification with him but provided the name and date of birth of a 23 year old Camden man. There was an active traffic warrant for that man. The driver was subsequently taken into custody and transported to headquarters. There, photographs of the man were obtained from NJDMV and it was learned that the identity he provided was not actually him. Once his true identity was revealed it was discovered that the 21 year old Camden man was a Wanted Person from the Salem County Prosecutor’s Office and also had numerous outstanding criminal warrants from numerous municipalities. He was charged by Logan Township Police with Hindering Apprehension, processed and transported to Salem County Jail pending court appearances. June 10: Police were dispatched to the Holiday Inn, 1 Pureland Dr for a disturbance involving an intoxicated male. Upon arrival it was discovered that a 27 year old male from Rison, AR had been at the Village Pub with coworkers and became engaged in a verbal dispute with several patrons at the bar. His coworkers were able to get him out of the establishment and got him back to the hotel. Once there, he was heavily intoxicated and reportedly had another dispute with other guests before ultimately returning to his room. At that time, he caused damage to the mirror, desk and a chair within the room. The Holiday Inn charged the man’s credit card for the cost of the damages and he was ordered to vacate the property upon sobering up.